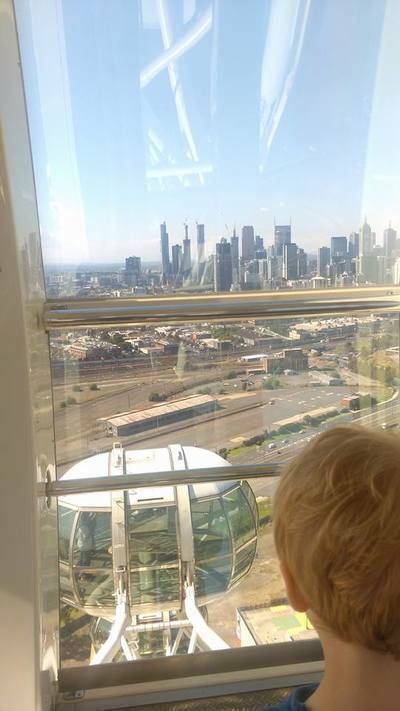 District Docklands boasts the Melbourne Star Observation Wheel; a tourist attraction that perhaps doesn't get the attention it deserves. 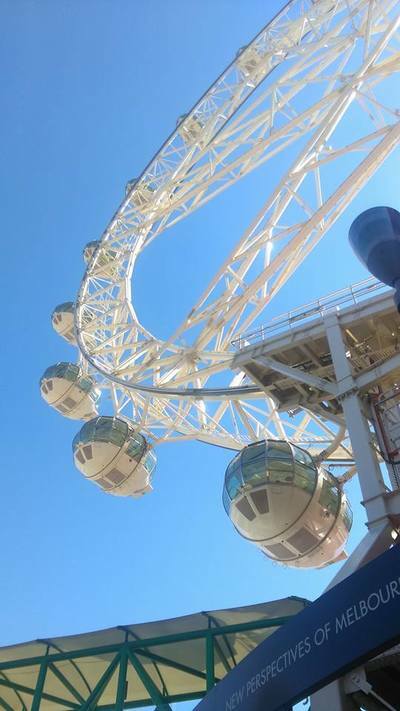 Melbourne's very own giant ferris wheel is the only one in the Southern Hemisphere, offering a ride (one rotation) which takes 30 minutes and offers 360-views of up to 40 kilometres, from Melbourne's CBD, Port Philip Bay, and on a clear day, as far as Mount Macedon, Arthur’s Seat and the Dandenong Ranges. 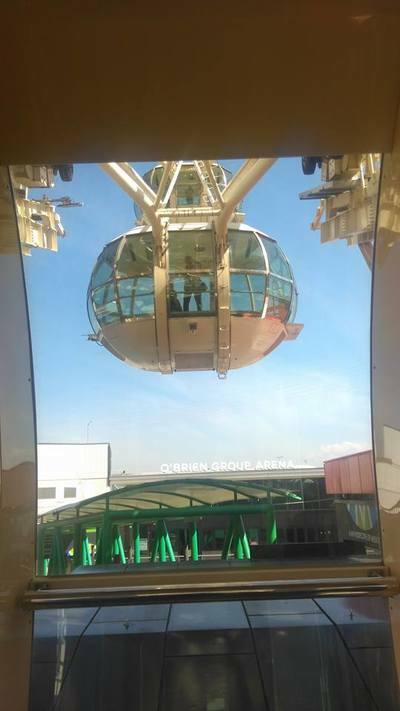 After a little wobbly past, when the Star closed in 2009 and didn't open again for another 5 years, Melbourne's unique tourist attraction opened to the public in 2013, and has been rotating over Docklands ever since. 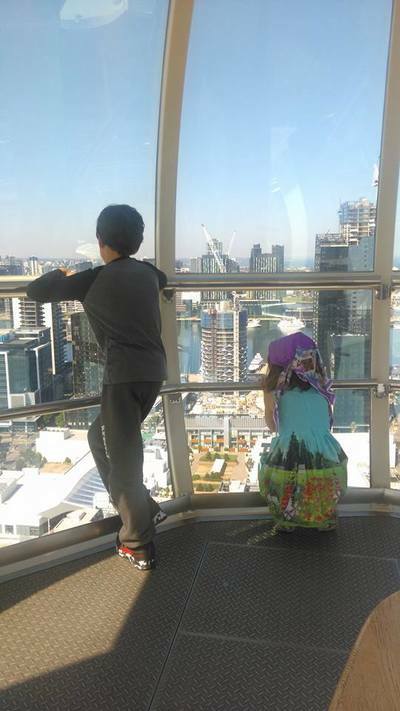 Taking the children on the Melbourne Star Observation Wheel for the first time this Easter (when kids fly free), we really enjoyed the experience, even Mr.3 who can sometimes be a little nervous when faced with high heights. Each cabin is considerably roomy, much more than you'd imagine when watching from a distance. Cabin capacity is at 20 people, although at the time of our flight, were didn't need to share outside of the group we were in, only because there were not too many people waiting in line. 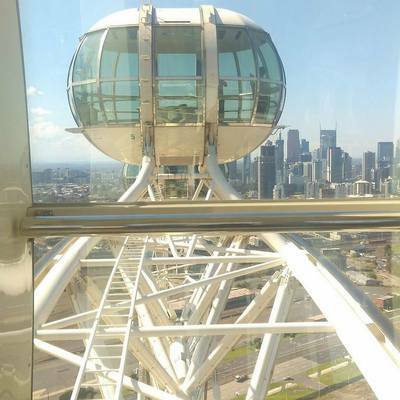 The Melbourne Star Observation Wheel's journey is gentle and pleasant. 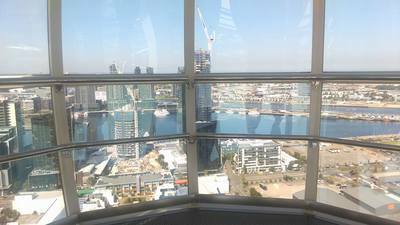 It isn't really possible to see Melbourne the way you do from the Star, from anywhere else in the city. The kids enjoyed watching the trains chug in and out of Spencer Street train station, and were enthralled to reach 'the top' of the Star and see out to Port Phillip Bay and beyond. I'm a little weary of heights, so didn't venture much from my seat in the centre of the cabin. Regardless, I'd do it all over again, to see Melbourne again from a completely different angle. From the sky scrapers in the CBD to the green topped ranges in the distance, not forgetting the deep blue of Port Phillip Bay, the Melbourne Star Observation Wheel opens your eyes to Victoria's capital city, in a way you haven't seen before. What I would suggest though, is saving your 'flight' for a bright and sunny day, when your views will be further and your experience, greater. Next experience? A night flight on the Star. Sometime soon, hopefully. Save on entry with your Small Ideas voucher.